Today marks the seventh year since the tragic crash of Colgan Air, Flight 3407, which killed all souls on board and one on the ground. We remember those who lost their lives -- and we honor their memory as we continue to work for better protections. It is extraordinary, that through our focused advocacy and the reverberation of voices of Flight Attendants across the industry, we achieved the addition of 10 hours rest and an FRMP in the House FAA Reauthorization Bill within one year of launching our public campaign. The preparation prior to launch included a thorough review of membership feedback on the issue of rest, meetings with the FAA, the House Transportation and Infrastructure Committee staff, consultation with our MEC Safety, Health and Security Committees, the AFA Executive Board and a thorough assessment of the political realities we faced. 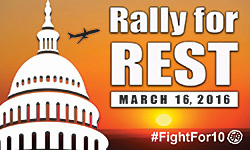 Once we launched our campaign publicly we built a coalition of support with other unions (especially CWA, IAM, ALPA, NATCA and Teamsters) and promoted the voices of tens of thousands of Flight Attendants who took part in making this issue a priority for lawmakers who must respond to you as their constituents. Now that we have our full language in the House bill, the Aviation Innovation, Reform and Reauthorization Act of 2016 (AIRR Act), we have passed the most difficult hurdle in driving this to become law. FAA funding is set to expire on March 31, 2016. Either the bill will be passed by then or Congress will set an extention and extend the deadline. Either way, this bill is ultimately must-pass legislation. Our next effort is to achieve the same language in the Senate version and stay very close to the entire process until the our 10 hours and FRMP becomes law. This raises the standard for all Flight Attendants across the industry and provides a stronger foundation for negotiating better rest in our contracts. Ultimately, this is about safety, healthy, security and equality – and it demonstrates respect for Flight Attendants as aviation’s first responders. "Proper rest is critical for Flight Attendants to do our work as aviation’s first responders. We worked very hard to achieve this common sense regulation and we will continue to push until the minimum 10 hour rest becomes law. Science confirms Flight Attendant fatigue is real and we must all commit to combat fatigue for the continued safest transportation system in the world. AFA commends members of the House Transportation and Infrastructure Committee for working with us on proper rest and all of our safety initiatives for this bill,” said AFA International President Sara Nelson.